What Can Sharks and Jellyfish Teach Us About Marijuana and President Obama? A glimpse inside the oceans can help us answer the question about whether or not marijuana is more dangerous than alcohol. The New Yorker’s January 27 profile on the U.S. president has kindled debate over many views Mr. Barack Obama expressed, but nothing in the piece grabbed more attention—both positive and negative—than his statements saying marijuana isn’t more dangerous than alcohol. The statements sparked delight across the nation among fraternity members, Rastafarians, fans of the Grateful Dead and Lil Wayne, and plenty of “regular Americans” too. But is smoking pot really no more dangerous than drinking alcohol? Let’s consider the question by consulting three authorities. “It appears that President Obama is ignoring the science, but favoring the politics of pot,” said Dr. Eric Voth, Chair of the Institute on Global Drug Policy. Science has produced an abundance of data showing that, when alcohol is abused (i.e. consumed in high doses), it becomes poisonous and can lead to a whole host of medical problems, including fatal overdoses. But it is extremely rare for smokers of marijuana to suffer fatal overdoses. That difference is emphasized ad nauseam by anyone “favoring the politics of pot,” as Dr. Voth says. It’s the leitmotif of marijuana propaganda. It is undeniable proof, pot advocates say, that smoking cannabis is less dangerous than drinking alcohol. A 2001 study called “Neuropsychological performance in long-term cannabis users” proved that marijuana’s adverse impact on the brain can last days or even weeks after the high from the drug wears off. This means people who smoke it daily or even weekly are functioning at a suboptimal intellectual level at all times. They experience distorted perceptions, impaired coordination, difficulty in problem solving and trouble with learning/memory. A 2012 Duke University study showed that IQ scores dropped for teenagers who started smoking marijuana and continued into adulthood. Another study found that long-term pot smoking causes changes in the brain like those that occur after long-term use of harder drugs. Still another study proved that regularly smoking the drug significantly reduces an individual’s motivation and ambition. This is, in part, because of its effect on brain cells containing dopamine. Research proves that cannabis use also often leads to addiction. 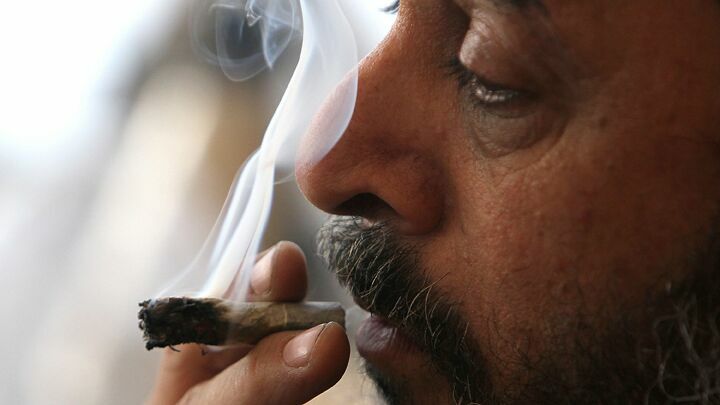 According to the National Institute on Drug Abuse, about 9 percent of people who start smoking sporadically in their adult years become addicted to pot. This number jumps to 17 percent for users who begin smoking pot at younger ages. And it leaps to 25 to 50 percent for those who smoke daily. Numerous studies associate marijuana with respiratory disease and mental illness, including schizophrenia. Studies also show chronic use to increase rates of depression, suicidal thinking and anxiety. Research shows that although cannabis does not normally cause fatal overdoses, it can lead users to engage in all kinds of behaviors that cause death. Is it more dangerous to swim through a tank full of Irukandji jellyfish, or one containing some nurse sharks? With the jellyfish, you’d be pretty much guaranteed to make it to the other side alive. But no matter how long you stayed in the water, and no matter how carefully you swam through it, you would definitely sustain numerous stings. The stings would cause serious physical and psychological symptoms. Nurse sharks, on the other hand, are harmless and even love to be petted by people. If you swam through their tank cautiously and respectful of their power, you’d be guaranteed to make it across without any injuries. You would probably even have an enjoyable time with the beautiful, gentle giants, as many divers and snorklers do! But if you behaved irresponsibly by punching or otherwise abusing one of the sharks, it would likely attack and possibly kill you. Drinking alcohol is like swimming through the tank of nurse sharks: It’s not dangerous if it’s done responsibly and cautiously. But smoking marijuana is like crossing that pool of Irukandji jellyfish: There’s absolutely no way to get through it without sustaining some pretty significant damage. It also means the government is obligated to enforce laws banning marijuana equally across the nation. Everyone in Washington and Colorado who smokes pot, or allows cannabis sales, is breaking federal law. Finally, let’s examine this question from the point of view of the Holy Bible, which is, after all, the Creator’s “instruction manual” for mankind. The Bible does not mention marijuana, but many regular smokers of the drug claim that their habit is sanctioned by something God told Adam back in Eden: “Behold, I have given you every herb bearing seed, which is upon the face of all the earth, and every tree, in the which is the fruit of a tree yielding seed; to you it shall be for meat” (Genesis 1:29). Cannabis smokers are especially fond of this King James rendering of the verse since it uses the word “herb”—a common modern nickname for marijuana. It’s a fair question, and can be answered in part by looking at the word “meat” in that scripture. It is translated from the Hebrew oklah, and very specifically means food. The verse is clearly talking about edible vegetation. This passage doesn’t give the green light to smoking marijuana any more than it sanctions ingesting poison ivy or hemlock. Numerous studies prove that smoking anything is harmful to our lungs. God says people should glorify Him in our bodies: “Do you not know that your body is a temple of the Holy Spirit within you, which you have from God? You are not your own; you were bought with a price: So glorify God in your body” (1 Corinthians 6:19-20, Revised Standard Version). The Bible also emphasizes, in Romans 13 and elsewhere, that God wants people to obey the laws of the nations they live in (as long as those laws don’t require breaking His law). What does the Bible say about drinking alcohol? Unlike the subject of smoking marijuana, the Bible does discuss many specific aspects of drinking. Scripture cautions sternly against excess drinking. It issues clear warnings about what the results of drunkenness can be in passages like Ephesians 5:18, Galatians 5:21, Isaiah 5:22, Proverbs 20:1 and Proverbs 23:21, 30-32. The Bible is adamant that people should not become inebriated by anything because it robs us of self-control and can lead to numerous problems. But Scripture also reveals that—when used in moderation—alcohol is a gift from God! Psalm 104:15 lists it among blessings God gave to mankind. In 1 Timothy 5:23, the Apostle Paul says a little wine can be good for digestion; recent studies have proven that to be true. Alcohol is also listed as something that can bring greater enjoyment to celebratory situations (e.g. Deuteronomy 14:26; John 2). Old Testament prophecies about the joyous Millennium also sometimes use wine to symbolize the abundance of spiritual and physical blessings that will fill the Earth (Amos 9:13). It’s true that many men and women have turned the blessing of alcohol into a curse, and many lives have been damaged or ended by abuse of the drink. But alcohol can be enjoyed moderately and correctly. Marijuana, however, can not be smoked in any way that is correct and healthy. Science, the law of the U.S., and the ultimate authority of the Holy Bible agree that marijuana is more dangerous than alcohol. President Obama’s statements to the contrary were built on lopsided and discredited arguments. Whether the president likes it or not, he plays a key role in setting the moral tone of the United States. His decision to wade into this controversial topic and flippantly undermine U.S. law is hastening the nation’s slide into lawlessness and destabilization. The most alarming part is that the destabilization he is accelerating may not be as accidental or cavalier as it may, at first glance, appear. To understand more, read America Under Attack.